Nothing suitable in promotional event binoculars? How about custom branded caps & funny hats, logo printed corporate binoculars or one of our promotional event sponsorship? Promotional binoculars are ideal for event promotions as they allow the spectator to get more of the action on the field. 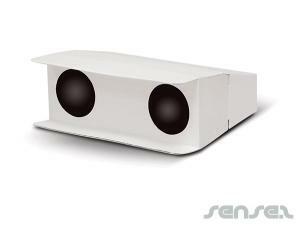 We have a innovative range of logo branded binoculars to suit your corporate campaign. Choose from our quality binoculars with up to 25 x magnification and custom print them with your company logo. 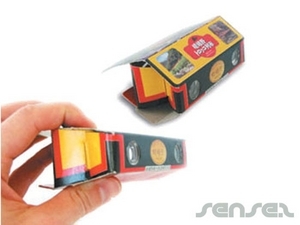 Or use our cheap cardboard binoculars that are printed allover for a large scale sports promotion where you are wanting to have maximum effect for your budget spent. A similar binocular are our pop up binoculars, practical and ideal for mailouts and handy cheap corporate Promotional campaigns. 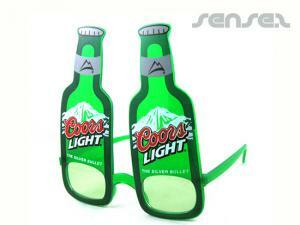 We also carry a innovative range of shaped binoculars that you can custom print with your company logo. 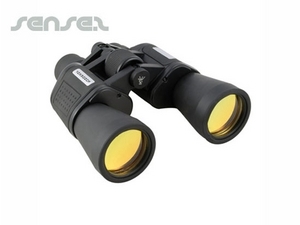 Choose from binoculars in the shape of soccer balls, tennis ball shaped binoculars or cricket and basketball as well as baseball bat shaped binoculars. Choose our plane shaped binocular for travel promotions or our can shaped binocular for drink Promotional sponsorship on events. 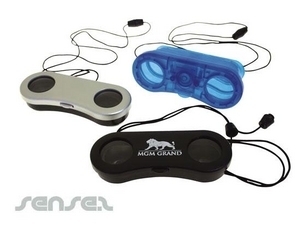 All our binoculars are custom branded with your company logo and make great promotional gifts for events.